We like to make people feel welcome and relaxed. Elaine and Adge extend to you a very warm and friendly welcome to The Abingdon. 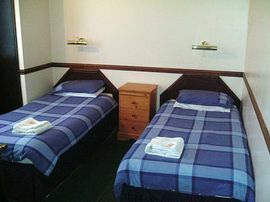 We are a 5 bedroom, all en-suite guest house. 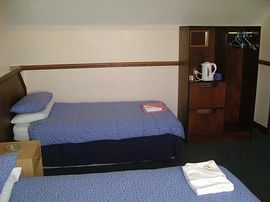 All rooms have free view colour T.V's and complimentary tea/coffee making facilities. There is a daily maid service, supplying clean towels and soap. 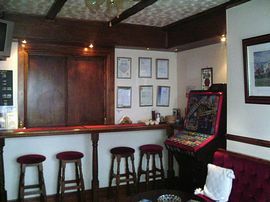 We have a fully licenced bar/dining room, with vegetarians well catered for. We have good off street parking, both front and back and are about 15mins walk from the sea front and other attractions. We are very easy to find, once leaving the motorway and are only 10mins from the railway station. We are very proud of the number of returning customers with many saying how it feels like home from home. We are happy to except large all male/female parties by operating a £200 up front cash bond for any breakages or misshaps and will take bookings for 1 night or longer. 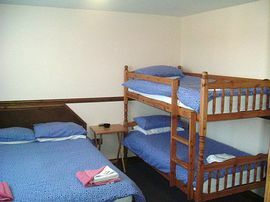 MON-FRI STAY 4 NIGHTS ONLY PAY FOR 3! FRI-SUN STAY 2 NIGHTS ONLY PAY FOR 1! For those early risers, a pack lunch can be provided. Special Diets Provision: Special diets are catered for. Vegetarians catered for. We were amongst the first here. Still coming back for the veggie breakfast and warm welcome. Thank you Elaine and Adge for providing such a welcoming bolthole from the real world.Roz & Paul. "The Police Ladies" Fantastic weekend, lovely breakfast, thank you, see you again soon. "Mr Briffitt" very friendly staff, great atmosphere & made to feel at home. It must be good because I keep coming back. Jim. By car. Leave M5, Junc 21,follow signs for local hotels, guest houses and b&b's. Stay on old road into weston.Road becomes Locking road.We are a couple of miles down Locking rd on the right hand side, just past the esporta health spa.